Original art by Sara Asch. As some of you may know from other outlets, awhile ago now, the city took down Little Free Library Reykjavík. I haven’t actually gotten the full story, but I have to assume that this happened because the library had been damaged for a long time and there was confusion about the fact that it hadn’t actually been abandoned. This is, of course, disappointing. LFLR had a pretty short run—and an even shorter one as an undamaged, fully-functional library—but that doesn’t diminish the fact that so many people—both here in Iceland and abroad— took part in the book exchange and enjoyed LFLR while it was in place. I’ll let everyone know when the new LFL(R) is up and running. I’m so delighted that the idea is going to continue here! 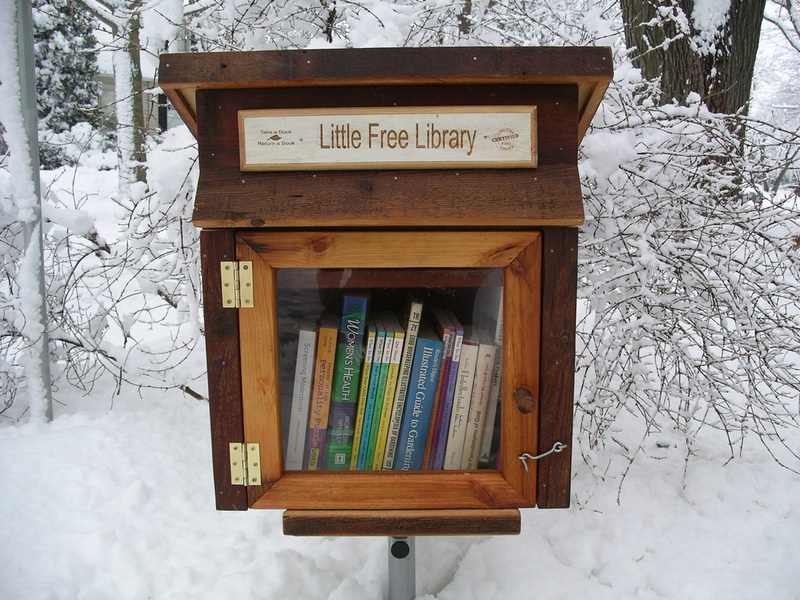 The Little Free Library in Reykjavík will look a lot like this–I’m going to build it myself using a kit. The wood in the kit has been salvaged from a barn that blew down in a tornado 100 years ago! Now Larissa, you are saying: you are always rambling on about libraries. What is this Little Free Library thing all about? The Little Free Library project was started in Wisconsin in the USA. The idea is to place a small, weatherproof hutch, house, or other interesting structure (there’s one in an old fridge in New Zealand, and Berlin is making them out of hollow tree trunks) in a public place, fill it with books, and then let people come borrow and return them at will. It’s like your typical “take a book, leave a book,” but better because it is not just a place to discard old books and magazines that you don’t want, but rather, a thoughtfully curated mini-library which can bring together broad communities of readers in a new way. I’ve included informational links about the project–the fundraising page, website, and Facebook page–below, but would be delighted to talk about this project further if it is of interest. Just send me a message and I’ll be totally thrilled to talk tiny libraries with you. If you think this is a worthy project and can donate a little money to the cause, I will be extremely grateful (and will also send you a neat, probably handcrafted gift–see the first link for more info on that). If you are on the fence about why you, a reader who may not be in Iceland or have any immediate plans of visiting Iceland, might want to donate to this project, I encourage you to check out the Little Free Library Reykjavík FAQ page. And donation or not: if you can share this project and its information with the library/literary lovers in your life, I would be immensely grateful. The success of something like this really depends on finding the widest audience possible–so thank you in advance! In a bit of a break from my usual reviewing/event recapping freelance gigs, I have now had my first quasi-journalistic experience. The February issue of The Reykjavík Grapevine features an article written by yours truly about Café Lingua, a weekly language exchange program at the Reykjavík City Library. And guys: I had to do actual reporting for this article. Like, I conducted not only a phone interview (gasp! ), but also a series of email/Facebook interviews (getting better at this Facebook thing) and even one in-person interview. It was rather hard work, honestly, but it (Café Lingua) is a great weekly program and I’m pleased with the final article, so while I don’t think I’ll be turning into Rosalind Russell any time soon (shame, really–those hats! ), I think we can put this down in the success column. The piece hasn’t been posted on the Grapevine website yet, but if you’d like to know more about multilingual/multicultural Reykjavík, you can download the .pdf of the current issue here or read it online. 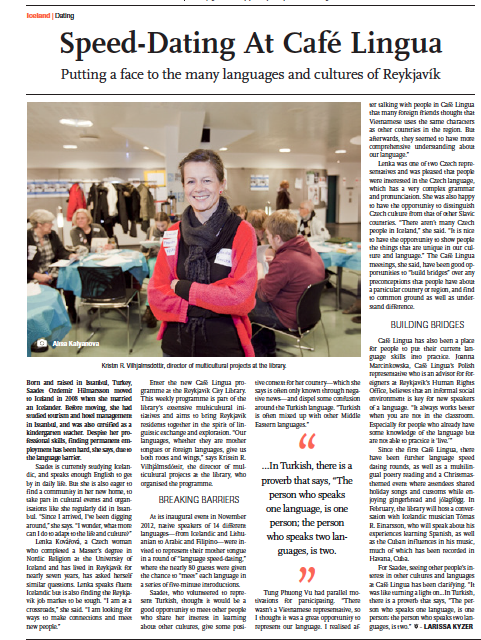 The article, entitled “Speed Dating at Café Lingua: Putting a Face to the Many Languages and Cultures of Reykjavík,” is on page 10. Over Christmas and New Year’s Mark and I were very lucky to have our friend Graham come to visit us. It says a lot for him that he was willing to come visit during this time of year–not only is it generally cold(ish), wet, windy, and very dark, there are also just a lot of things that you can’t do in Iceland between Christmas and New Year’s because so much is closed. There are actually still a decent number of tourists here, but many of those I saw walking up and down the shopping streets seemed a bit confused and glum about the forced window shopping. Iceland highly values its tourism industry, and, I think, tends to treat tourists very well, but they definitely don’t pander to out-of-towners around the holiday season. After some delightful research (winter-rental cabins, hot tubs, Icelandic countryside), we settled on renting one of the two cozy cabins at Kalastaðir, located right on Hvalfjörð (Whale Fjörð), in West Iceland. Driving the long way, as we did on our trip there, takes you all around the fjörð, which is absolutely breathtaking. Taking the efficient, super-space-age Hvalfjarðargöng tunnel on the way back–which Wikipedia tells me is “is 5,770 m long and reaches depth of 165m below sea level”–it was just a snappy 45 minute drive from Reykjavík. Which was really perfect, for our purposes, in that it was not too long a drive, and featured lovely scenery and countryside peacefulness, in a brand new (for us) part of Iceland. Just when you thought it couldn’t get any darker in Iceland–it did. We are down to about five-ish hours of daylight now, with the sun rising around 11 AM and going back down at 4:30ish. It is convenient that this new level of daytime darkness coincides with winter break because it has become really, really hard to wake up in the morning. And, of course, it is a cycle: it’s hard to wake up before the sun rises, so you sleep in until 11:00. You sleep in until 11:00, you stay up until 2:00 or 3:00 in the morning. Which makes it all the harder to get up before daylight…You see where this leaves us. Spending much of our time in the dark. Well, Mark and I have been making concerted efforts to get up before the sun these days, but failing that, it is at least important to try and get out a little (or be near a window facing the right direction) while it (the sun) is up, for our daily vitamin-D infusion at the very least, if not also to stave off seasonal depression. Yesterday, Mark was hard at work on a freelance project, so I had to cook up some activities for myself that would allow for some good out-in-the-sun time. Mark recently had to track down a book for class at the library in the neighboring town of Seltjarnarnes, and had suggested to me that I might enjoying returning the book for him. If this sounds like a horrible ploy for gullible girlfriends to you, let me clarify. As we know, I love libraries and like visiting different public libraries especially. Additionally, from the little time I have spent there, I really like Seltjarnarnes–it is located on the tip of the peninsula and is surrounded on three sides by the ocean, which makes it super windy, but also beautiful. It also boasts a fancily renovated pool in which not only all of the hot pots, but also the lap pool are salt-water, which is very nice on the skin. But I have not had the chance to visit this pool thus far. It is just kitty-corner to the Seltjarnarnes library (which is on the second floor of a small mall), so in fact, returning Mark’s library book would give me an excuse to do a lot of things that I would enjoy in one swell swoop. Yesterday, I told someone that the main branch of the Reykjavík City Library was my favorite place in the city, and they laughed. (‘Oh, you silly librarian.’) But I’m not being facetious: the Reykjavík City Library is, thus far, my favorite place in this city, and if I manage to learn to speak/understand any small amount of Icelandic this year, copious amounts of credit will necessarily be paid to the collection and the librarians at the Aðalsafn. Just a few stats about the Reykjavík City Library system, for the library-philes among you (I know I’m not the only one). The system is comprised of about five branches and a bookmobile, which I am delighted to say parks in my neighborhood for an hour on Mondays every week. (I haven’t had a chance to visit it yet, but that’s my goal for next week, because, guys: bookmobile!) Patrons/members/card-holders of/in the Reykjavík library system are also able to borrow and request books from the libraries in the nearby towns of Seltjarnarnes and Mosfellsbær. 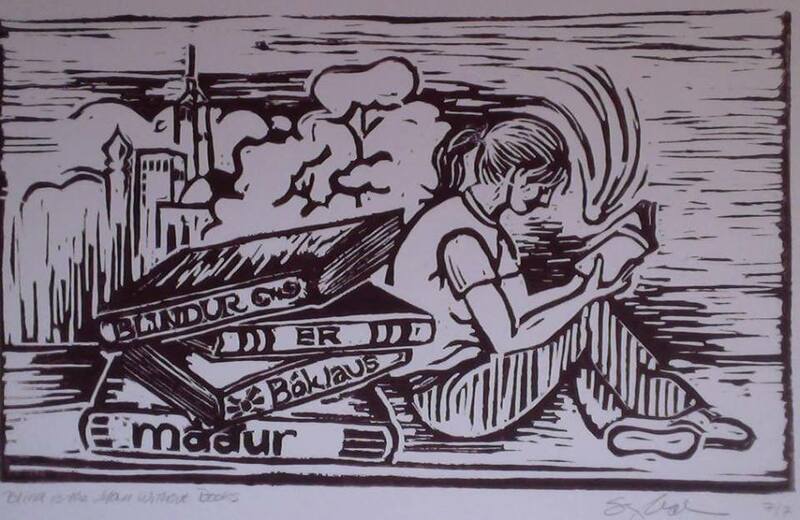 All of the library collections in Iceland–including the collections in the public libraries, university libraries, the national library, and the art, law, government libraries–are collectively cataloged in one online catalog, Gegnir, which also links to the online catalog of electronic journals and databases, Leitir. Holdings in the public library system are varied and extensive. At the main branch, you can not only find typical materials like adult novels and nonfiction texts (in Icelandic, English, and a multitude of other languages), CDs, DVDs, audiobooks, periodicals, etc–they also lend vinyl records (if only I had my record player here! ), VHS tapes, multimedia language-learning materials, and a huge amount of graphic novels and comics. Anyway, I’ve been enamored with the public library here since I arrived (my first act as a for-real permanent resident was to get my library card, remember?) but yesterday took my already overflowing goodwill toward the library to 11. 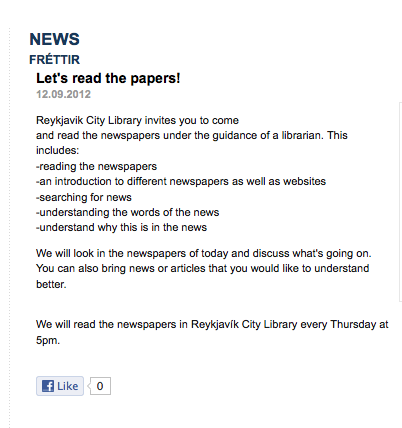 This seemed like a great outreach program for immigrants/newcomers in Reykjavík, and one which was geared toward people for whom reading in Icelandic would be a difficult thing. For me, it promised an opportunity to expand my vocabulary, practice reading in Icelandic, and also to meet and interact with some Icelanders in a pressure-free setting. (Because they are librarians and therefore awesome, and in this program are also are actually intending to interact with non-Icelanders in Icelandic.) I had missed the program for a few Thursdays running, but was bound and determined to make it this week.